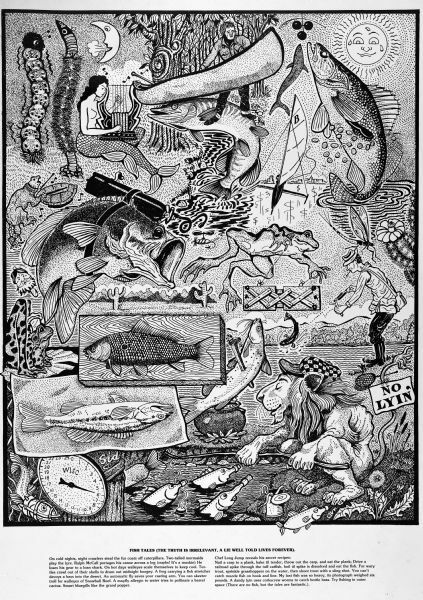 Imaginative pen-and-ink drawing titled, "Fish Tales (The Truth is Irrelevant, A Lie Well Told Lives Forever)." Sid adds the following words to describe the active scene: "On cold nights, night crawlers steal the fur coats off caterpillars. Two-tailed mermaids play the lyre. Ralph McCall portages his canoe across a log (oophs! It's a muskie) He loses his gear to a loan shark. On hot days walleyes scale themselves to keep cool. Turtles crawl out of their shells to drum out midnight boogey. A frog carrying a fish stretcher decoys a bass into the desert. An automatic fly saves your casting arm. You can skeeter troll for walleyes of Snowball Reef. A mayfly allergic to water tries to pollinate a barrel cactus. Smart bluegills like the gran popper. "Chef Long Jump reveals his secret recipes: "Nail a carp to a plank, bake til tender, throw out the carp, and eat the plank; Drive a railroad spike through the tuff catfish, boil til spike is dissolved and eat the fish. For wary trout, sprinkle grasshoppers on the water, then shoot trout with a slingshot. You can't catch muzzle fish on hook and line. My last fish was so heavy, its photograph weighted six pounds. A dandy lyin uses corkscrew worms to catch bottle bass. Try fishing in outer space (There is no fish, but the tales are fantastic.)." Sid's authorship is in the lower left. This drawing appeared in the Capitol Times on May 2, 1987. Sid Boyum annually created an "Opening Day" drawing to promote the first day of the general fishing season, published from 1963 to 1989 in the Capital Times and the Wisconsin State Journal. In exchange, Sid would receive copies of the print to distribute on his own.